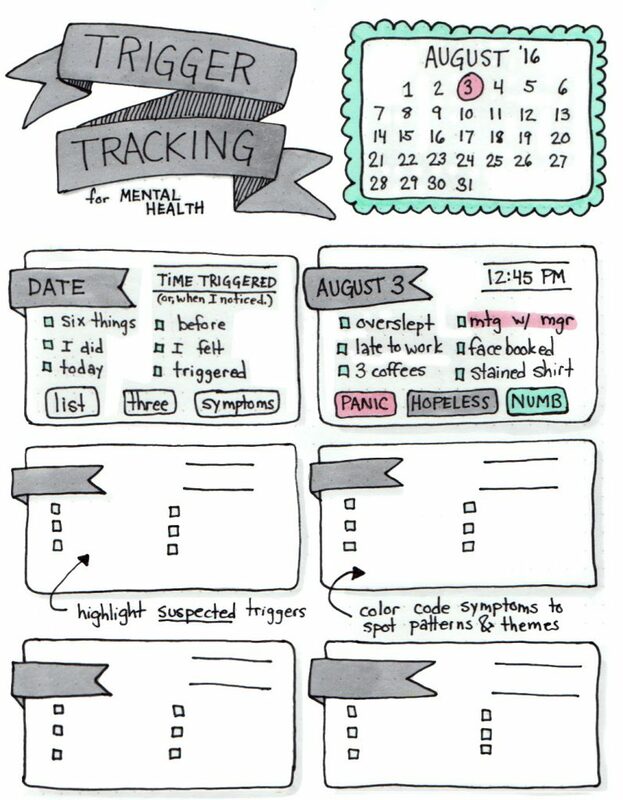 Recently someone in a BuJo (Bullet Journal) group I follow asked if there was a bujo layout to track mental health triggers. 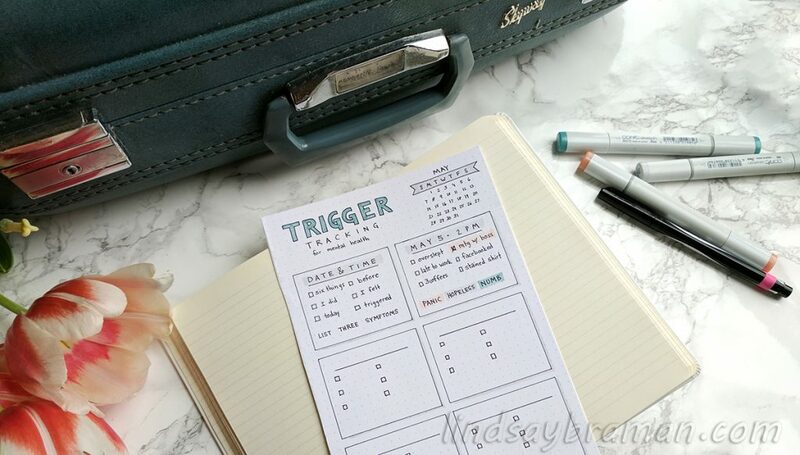 When her query had no response, I decided to draw on my own experience long-format journaling about my own triggers and develop a bullet journal style layout for tracking triggers. One element that can make trauma triggers overwhelming to manage, particularly early in recovery, is that it takes time practicing self-awareness to learn to recognize and name that what you are experiencing is actually a trauma response. (PsychCentral has a great explanation of what a trigger is.) “Being triggered” can look and feel different for different individuals. This layout assumes you have some growing awareness of what the experience of being triggered feels like in your body. I designed this layout to help a bullet journal user begin to track themes and notice patterns. Keeping a journal to build awareness of your mental health and the experiences that affect your mental health can help your recovery and help your mental health provider know how to help you deal with triggers. Below, I’ve explained 3 less-obvious ways to use this layout to improve self-awareness and better identify patterns. Bullet six things you did during the day. If you think you know what the event/stimuli was that triggered you, highlight it. At the bottom, use three feeling-words to describe how you experienced the trigger. (Different triggers may have a very different impact on your mind and body and this knowledge is really helpful in recovery) Color code your feeling words later so you can use color to visually spot patterns and themes. Hi, I am unable to find a PDF to print this. Hi Clarissa! Thanks for the reminder to post it! You can download a pdf version of this bullet journal layout here. Hi Lindsay! 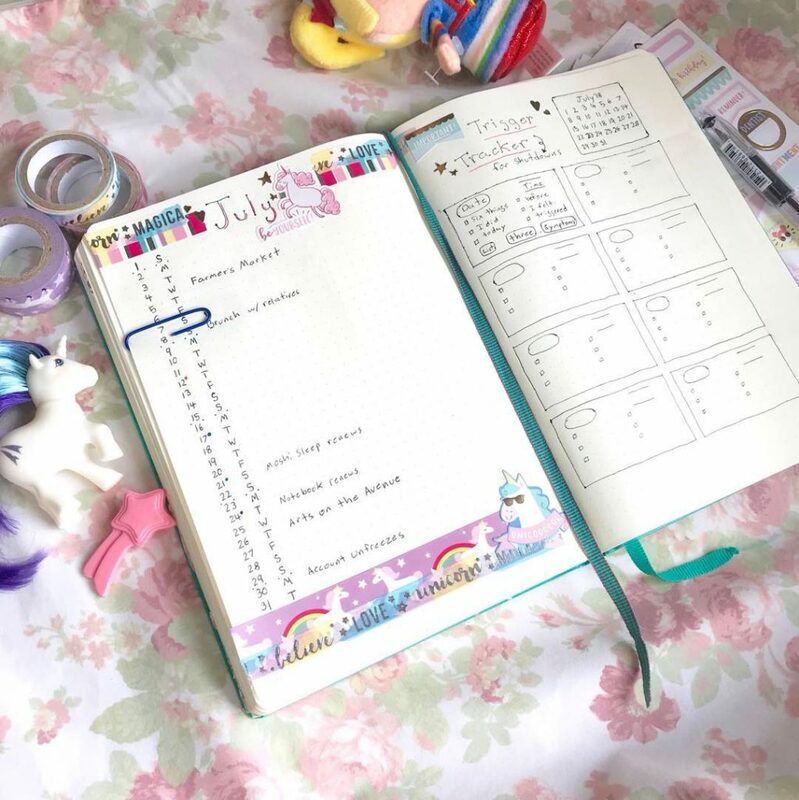 I was wondering if there are trackers and printables available to print and use in a planner/binder. (That don’t have dates, etc.) I love what you have designed and have available and would love to use it myself!! I also would be more than willing to pay for them as well!! Thank so much for your response! Hi Marci- that’s a really good idea I had not thought about! I’m going to make a note to work on a printable version like that after my finals are over in a couple weeks! Thanks for getting back to me! I’m so excited that you would consider making a printable version!! Please let me know when you do! !